Tecumseh, Oklahoma — Police claim that they needed to protect themselves, when they chose to handcuff and, according to the child’s father, use excessive force, on a nine year old elementary school student. The boy’s father, Morgan King, arrived at the school to pick up his child just as the officer was carrying his handcuffed son inside to the school principal’s office. The police allege the young boy was making threats against the school staff. King does not contend that his special needs son has a history of disciplinary problems, but argues that the incident should have been a school matter, not a police one. In the body cam footage, we hear the boy and his father pleading for him to be released from the handcuffs. We also see the agile little kid manage to bring his hands to his front from behind his back. While we cannot see the initial incident leading up to his detention, he does not appear to be a threat to the officer in the video that we can see, and with his father present, it is clear there were better alternative ways of handling this situation. A woman reporting to be his mother, Amanda Dawn Burton, claims her son ended up with 13 or more bruises to his body. 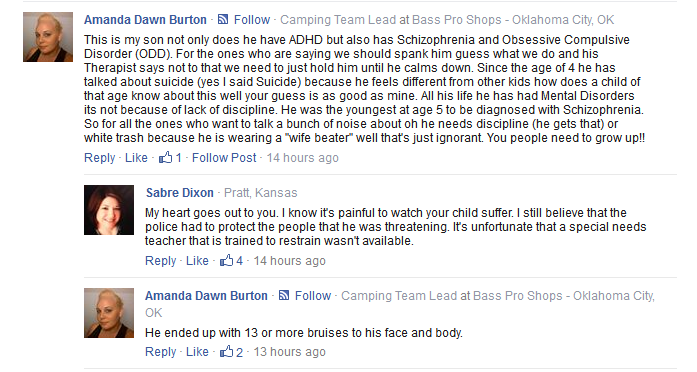 Burton also stated that not only does he have ADHD, but also Schizophrenia and Obsessive Compulsive Disorder, in defense to people criticizing her parenting in the comments on the News9 article regarding the incident. She also alleges the child has been suicidal in the past. Instead of helping and guiding this troubled youth, the school system has decided to treat him as a criminal. If you are already looked at and treated as a problem at age nine, where do you go from there? Its sad to see the lack of compassion and guidance offered in a place which is supposed to be safe and helping to mold young minds. Monday, we also reported on 13 year old Kevin, who was held down by multiple officers and cuffed while they rubbed his face in the ground for simply refusing to get up from his desk. More and more we are seeing our schools looking like prisons or even battlefields. Just a couple of weeks ago we reported on San Diego schools getting a Mine-Resistant Ambush Protected (MRAP) vehicle in a growing trend of school police receiving military weapons. We also reported on Ixel Perez, a 4’11, 100lb, 10th grade student who was tackled, assaulted, and detained by three police while sneaking a cell phone call in the hallway to check on her ill mother. With police officers on duty even in elementary schools, can anyone explain to me how we aren’t living in a police state? Where do we draw the line?